﻿ 1960-72 TRAILING ARM AUXILIARY SPRING BUMPER PLATES | Vintage Chevy Trucks - We are the largest parts supplier in the world for your 1967 - 1972 Chevy or GMC Truck! 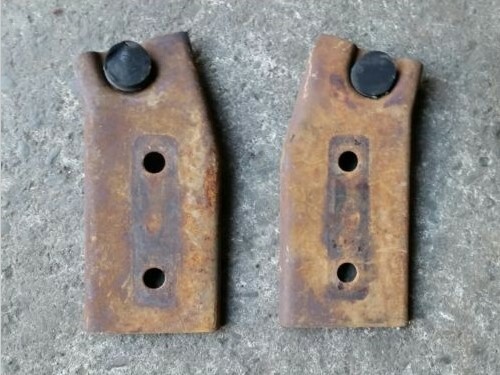 PAIR OF 1960-1972 REAR TRAILING ARM AUXILIARY LEAF SPRING BUMPER PLATES. PLATES GO IN BETWEEN REAR END HOUSING AND TRAILING ARM. FITS TWO WHEEL DRIVE COIL SPRING 1967-1972 CHEVY/GMC TRUCKS, SUBURBANS, 2WD, C10, C30. ALL IN GOOD USUABLE CONDITION, NO THROUGH RUST, CAME OFF A CALIFORNIA TRUCK! KEEP YOUR TRUCK GM!